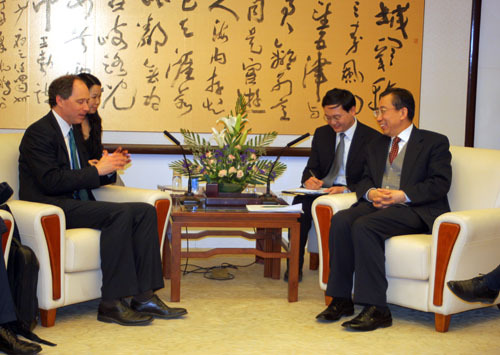 On March 18, 2010, the 18th China-UK Human Rights Dialogue was held in Beijing. Assistant Foreign Minister Wu Hailong met the UK delegation. The dialogue was chaired by Shen Yongxiang, Special Representative on Human Rights Affairs of the Ministry of Foreign Affairs of China and Scott Wightman, Director General of the Asia-Pacific Directorate of the Foreign and Commonwealth Office of UK. Wu said that China sets great store by developing the relationship with the United Kingdom. Foreign Secretary David Miliband just concluded a successful visit to China, which upgraded the level of strategic dialogue between China and UK and further pushed the development of China-UK relations. The Chinese side always holds a positive attitude toward the human rights dialogue. China believes that the dialogue will help to increase UK’s understanding of China’s national circumstances and human rights situation and promote the stable development of bilateral relations. The Chinese side is willing to work together with UK to deepen pragmatic bilateral cooperation in different fronts and further increase communication and coordination on major regional and international affairs in a bid to drive the constant development of the comprehensive strategic partnership between the two countries. Wightman said that the UK government attaches great importance to developing the relationship with China, is greatly encouraged by the tremendous achievements made by China in economic and social development and expects to further promote the comprehensive strategic partnership with China. In the dialogue, China and UK respectively introduced their latest developments in human rights area and had in-depth and candid discussions over a number of topics including the role of lawyers and management of them, issues of mutual interest and cooperation in the international human rights arena. China introduced some major moves such as the measures to deal with the international financial crisis and protect people’s livelihood and the Electoral Law amended by the third session of the 11th National Peoples Congress of China. UK spoke highly of the efforts and achievements made by China in promoting and protecting human rights and introduced the new legislations and measures in relation to human rights and the lawyers’ management system. The two sides increased each other’s understanding and achieved positive results through the candid and in-depth dialogue. The UK delegation will visit Yunnan from March 19 to 20.